Changes in the making, as Bill Taylor (left) passes on the Farm Air tradition to Joe (right) and Harley Curless (center) at the Astoria strip during Open House. 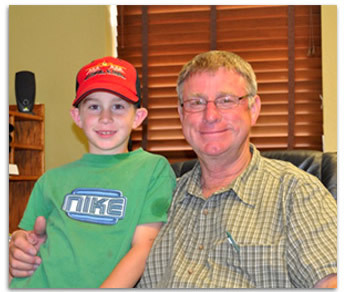 Harley Curless in his new office with his oldest of seven grandchildren, nine-year old Kody Wickert. Bill went to Air Tractor proposing his retirement and the selling of Farm Air to Harley. In March 2009, Air Tractor announced the ownership transition of Farm Air would include the Air Tractor dealership. Bill and Harley had a busy schedule ahead of them; putting everything into place for Farm Air, Inc. to be operational with its new owner by January 2010. Harley began his expansion plans for Farm Air immediately after the announcement. This meant moving the company from Fairfield, Illinois to Astoria, Illinois, about 200 miles north. One of the first things he did was begin construction on a new hangar to accommodate maintenance and an expansive parts inventory. The 150 X 120 hangar, with its 76-foot Schweiss hydraulic arm door was completed in March 2010. Included in the hangar is a 30' X 120' office space and parts department. New for Farm Air will be an onsite full maintenance shop (excluding heavy engine maintenance). Three FAA licensed mechanics have been hired, with Donny Haley as the lead mechanic and Julian Taylor assisting. Each have been Air Tractor certified to rebuild wings, conduct eddy current inspections and replace wing spar caps. Farm Air is also a certified AmSafe installer for Air Tractor airbags. About 130 people visited Farm Airs Open House luncheon and spray clinic Wednesday, June 9. Fried catfish and butterfried pork chops were served. Several people had the thrill to take a ride in the new AT-504, flown by Curless Flying Service pilot, Mark Drath. Scott B. conducted Operation Sage aircraft pattern testing. Further expansion of Farm Air included increasing the parts departments inventory. Todd Henderson, an FAA licensed mechanic was hired as Farm Airs parts manager. Todd came to Farm Air with a parts department background from working with John Deere and Jet Air. Farm Air customers have access to parts 24/7. After hours, Todd has the Farm Air phone forwarded to his cell so that he can respond to an AOG need. Farm Air, like its sister company Curless Flying Service, doesn't have any one "key" employee. The two companies reflect the dedication of 30 employees during the busy spraying season and at least 12 during the off-season. "Our business is a group effort and members of our staff are very much appreciated," says Harley. "That group effort starts at home." 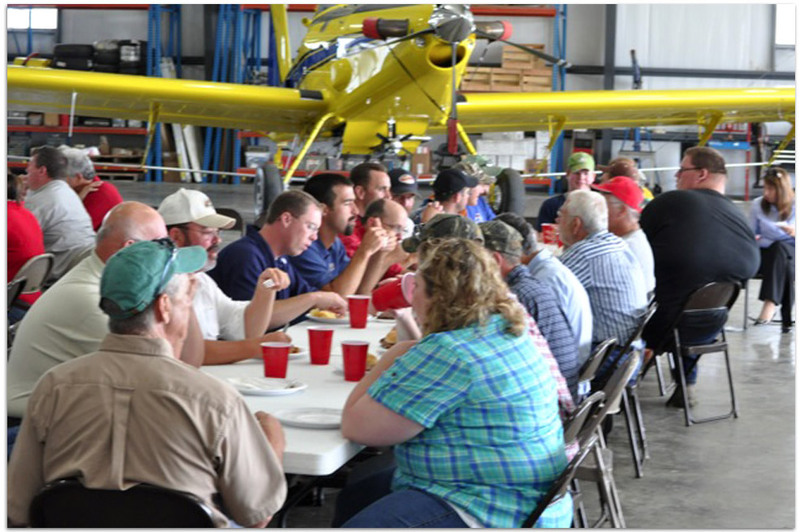 "Every day of the year our employees are committed to the support of each other and the customers of Farm Air and Curless Flying Service. I have had especially great support and understanding from my wife, Kay, for so many years that I can't begin to express my gratitude for her commitment and dedication to the industry and me. It is also very humbling for Mr. Leland Snow and Air Tractor to select me to represent the company as a dealer." 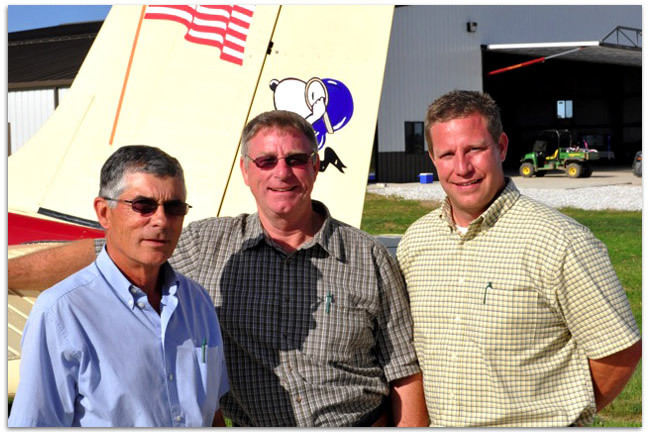 Although Curless Flying Service and Farm Air are two separate companies, they overlap each other in several ways. Both are based at the Curless Flying Service 3,400-foot sod airstrip. Farm Air will operate an AT-502 in Fairfield with Mark flying it. Curless Flying Service will continue to serve its customers, mostly flying from Astoria, with Harleys son, Joe, managing the flight operations. Bob Blickenstaff assists Joe managing a varied fleet of ag-aircraft. Another base is located in McLean, Illinois with Jack Holland acting as its office manager. Even though Mark Drath is one of Curless Flying Services AT-802 pilots, he is also an FAA licensed mechanic and when possible assists in the Farm Air shop. Mr. Hubert Cripe was given an honorary ride in the AT-504. Mr. Cripe served in World War II as a B-24 Liberator pilot. He was shot down over Berlin, germany and spent 14 months in a POW camp. With that big smile, he obviously enjoyed his flight. 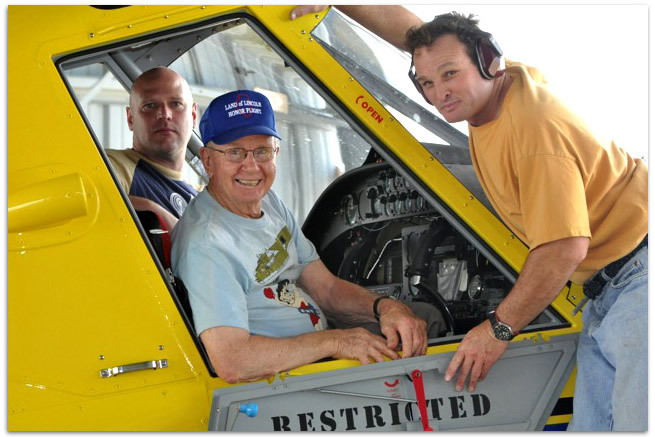 "It was my honor to have Mr. Cripe ride and fly in the AT-504," Harley said. "We are allowed to live in the greatest nation on earth because of all the veterans who risked it all for our freedom. I'm proud to be an American." "I've always enjoyed being an Air Tractor owner and pilot since I bought my first one from Bill in 1983. Before that, in 1980, I bought my first Ag-Cat from Mike Lee of Earls Flying Service in Steele, Missouri. Its amazing how fate can take a turn. Thirty years later, I sold an AT-802, to Mike Lee," recounts Harley. "Mike was my first outside sale of an Air Tractor. Farm Air has bought a new AT-502 to position in Fairfield for Mark to fly that will be for sale as a used aircraft. Curless Flying Service bought a new AT-504 that will be based in Astoria. It was the first AT-504 to be delivered in the U.S. We plan to use it in our spraying operations and for mentoring new pilots." Before Farm Airs Open House, Harley had already flown several spraying missions with the AT-504, mostly five GPA fungicide applications on potatoes. With a full 216-gallon load of fuel and 450 gallons of spray, Harley reported the AT-504 performed very much like an AT-502 flying the same airspeeds and handling similarly using the same power settings. He commented Air Tractor had added assist handles for easing entry into the cockpit. He particularly like the adjustable, rotating grip spray handle, like that found on early model aircraft and the excellent visibility from the cockpit. "The only thing negative I can find about the AT-504 is the lack of space under the pilots seat and that's not much of a problem. I'm sure some operators will figure a way to put things next to them in the copilots seat when it is not occupied." Much of the credit for Farm Airs smooth transition goes to its previous owner, Bill Taylor. "The new hangar here in Astoria wasn't ready in time to move the parts to when the sale of Farm Air was complete. Harley and I worked through that, with parts being shipped from Fairfield and the Air Tractor factory in Olney to customers, until we got moved. I would like to keep the Farm Air name going and I know Harley and his people are very capable of doing this. I plan to "hang around" in Fairfield when I'm not practicing my new pastime, golf. Most likely Ill be attending some of the trade shows with Harley, like I did this year and last, to introduce him to people I know. I guess you could say I'm kind of a consultant for Farm Air," explains Bill. Like anything worthwhile, it has been a challenging year since Air Tractors approval and completion of opening the doors for business at Farm Air at the Curless airport in Astoria, Illinois. The 30-year plus tradition of Farm Air will continue with enhancements that will benefit Midwest operators, as well as others throughout the country. The new Farm Air hangar is 150 wide X 120 deep. This includes the 30 x 120 office space and parts department. The 76-foot wide hydraulic door is manufactured by Schweiss.